The Johnson Summer Classic is a USTA-sanctioned, adult doubles tournament hosted every year in August. 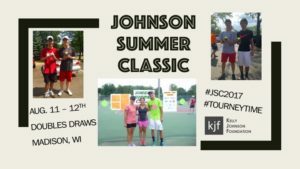 This year will be the 6th Annual Johnson Summer Classic benefiting the Kelly Johnson Foundation. 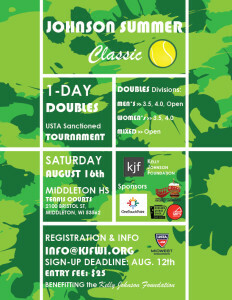 If you would like to get involved–play, volunteer, or sponsor the event, see the event information below. 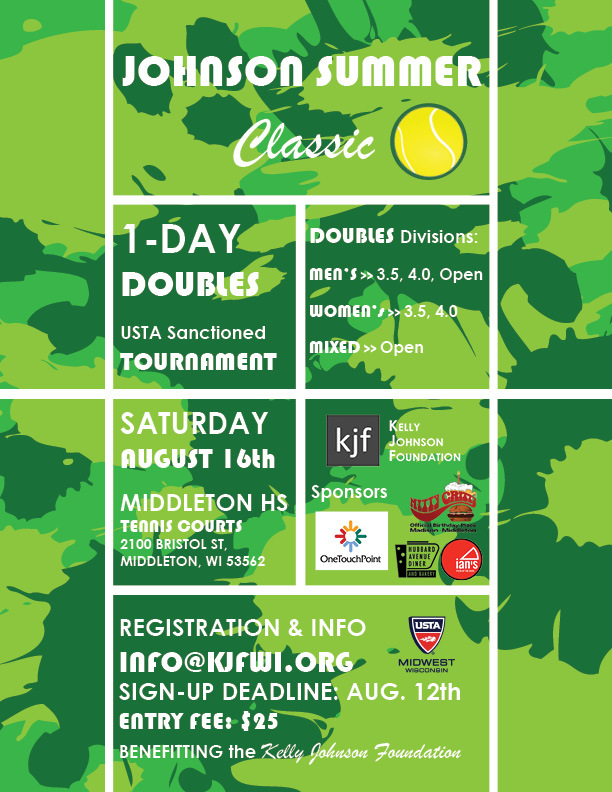 Sign Up Now through our USTA TENNISLINK Tournament Page…Coming Soon! We will start matches Saturday 9am and finish by 6pm. USTA-SANCTIONED. We are a District Event. All players welcome with a USTA membership. No membership, email Tournament Director Kelly how to participate! TROPHIES awarded to winning doubles teams in each division! RAFFLE PRIZE GIVEAWAY for ALL PLAYERS competing! Over 20 participants in 4 Divisions! 4 sponsors and raised over $350 for the Johnson Family Scholarship awarded in 2017. 12 participants in 2 Divisions! 3 sponsors and raised over $225 for the Johnson Family Scholarship awarded in 2017. Over 30 participants in 4 Divisions! 7 sponsors and raised over $500 for the Johnson Family Scholarship awarded in 2016. Over 35 participants in 5 Divisions! 9 sponsors and raised over $500 for the Johnson Family Scholarship awarded in 2015. Over 40 participants in 4 Divisions! 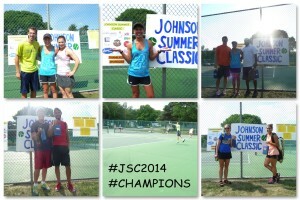 13 sponsors and raised over $225 for the Johnson Family Scholarship awarded in 2014.